I’m completely flipping out about this, because if they do keep it open like this, photography just got a whole lot more interesting for me. If they put a net up (like they should *cough*drunk people*cough*), it might remain difficult, but a nice free-air space to take photos from would be great. Hurry up and get here, Baseball! Someone mentioned that there was supposed to be plexiglass put up and it kind of looks like there might something as there seems to be a bit of a glare. If not then yes, this new design is a safety hazard on so many levels for the Fans, Players, Officers, and Employees. Selfishly, I want them to keep it open SO BAD. But yeah, I’d imagine they’d have to put something up. 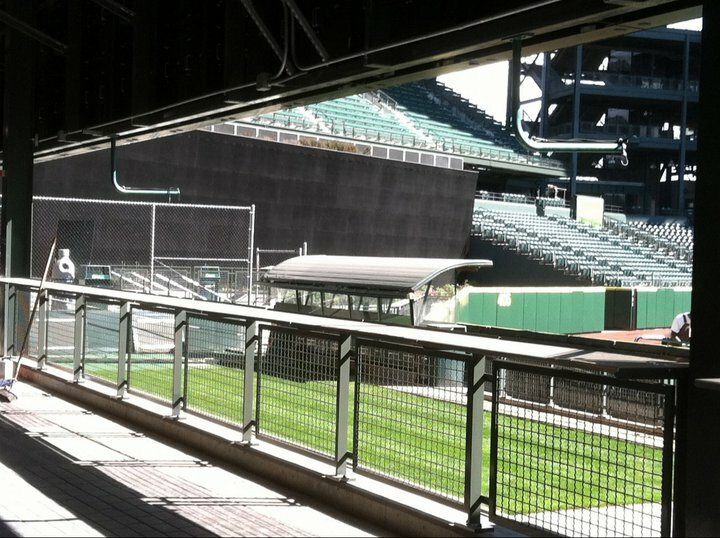 Personally, I’d prefer it NOT be plexiglass – people will scratch it, it’ll feel even more closed off than the gate. During Sunday games, there would also be a glare on the glass from the player’s perspective, I’d imagine, especially later in the year, when the sun stays low around the south side of the stadium all game, but who knows. I don’t think I’m seeing the same glare you are, the only glare I can see immediately is the glare coming off the side of the bench there. I have to think that they’d put something up…. Will do on the checking out Twitter pics. I took some of my own after work this afternoon, but would be curious to see what they’ve got up. @Mariners tweeted a few pics yesterday, including this one. Go back through their timeline and you can see some more new hotness.